Plate BM-618 has intricate floral motifs, mostly full-nail. This is the one on the left side. 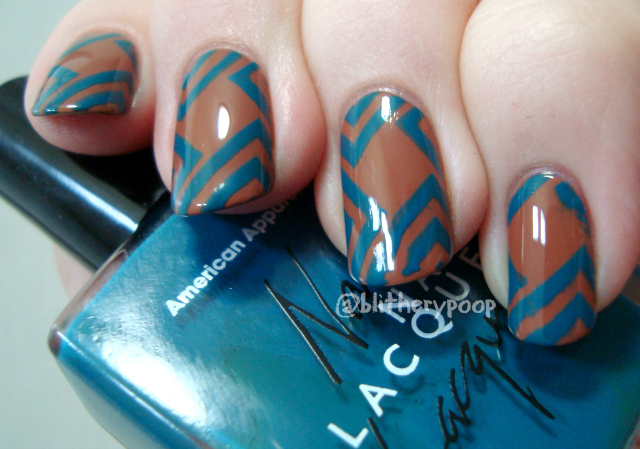 BM-607 is a bit folksy, with patchwork and swirls. This is the bottom image. I did something slightly different for this one. 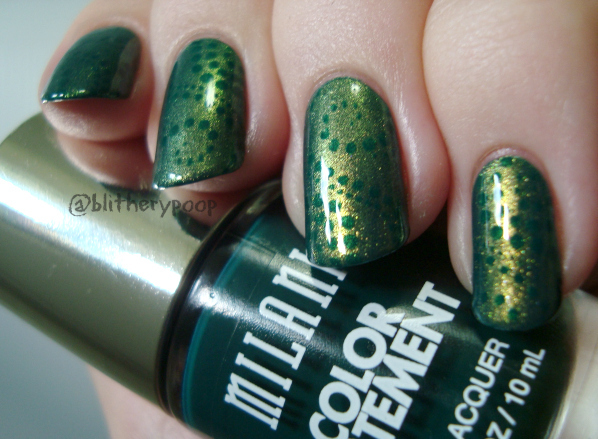 The base is Milani Enchanted Emerald, topped with Sinful Colors Outta Space. 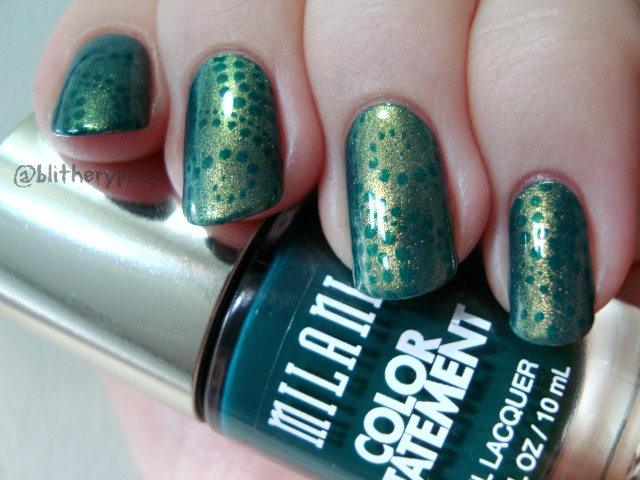 The stamping is Enchanted Emerald again, so it almost looks like Outta Space is what I stamped with. Doing this is sometimes a good way to get a "reversed" look for an accent nail if your plate set doesn't have inversions of a design and that's the look you want. 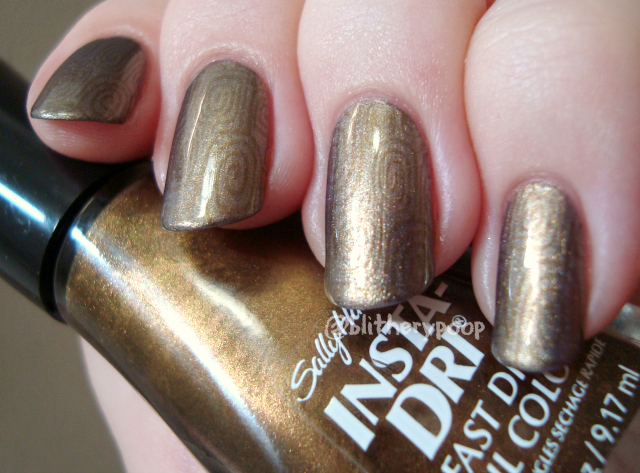 I also moved the image around from nail to nail for more of an "infinity" look, even though this is a full-nail image. I really wish Bundle Monster would do whole plate designs! There's some subtlety to the whole look, until the shift in Outta Space comes out more. Then the dots jump right out at you. The theme of BM-604 is bold and linear. This is the bottom image. My sister has a dress like this, I think. 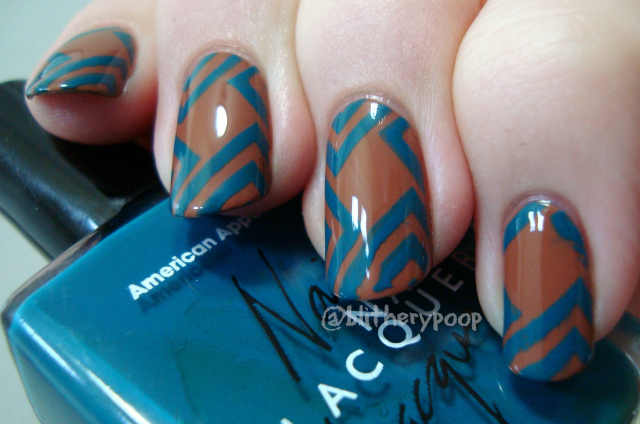 I haven't posted my swatch of OPI Ice-Bergers & Fries yet, so here's kinda a sneaky look at it. The stamping and the bottle I'm holding are American Apparel Peacock. So crisp! BM-608 is sorta...nature themed, I guess. Sometimes they turn out way more subtle than I meant. I'm working on organizing my collection, so I didn't take as much time to find the perfect polish to stamp with as I might have. 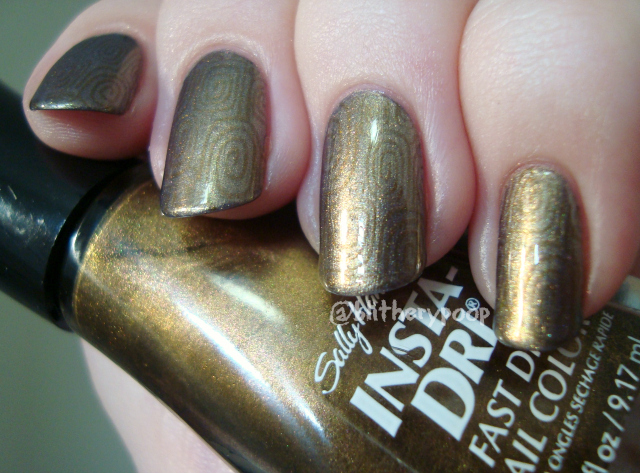 My mind was also kinda fixed on Sally Hansen, since that was the brand I was sorting. If I was going to redo this one, I'd still use Opulent Cloud as the base, but I'd probably use KleanColor Metallic Brown instead of Bronze Ablaze. I still like it anyway. So that fifth one? Nope! 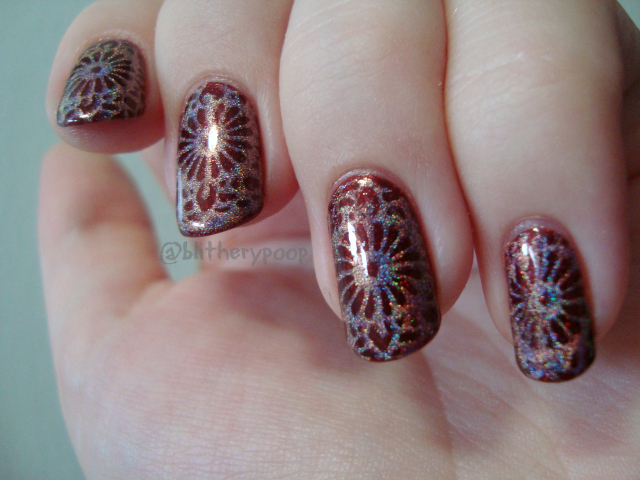 BM-619 has a kind of girly theme and I wanted to do a decal with the OPI-style little bottles in the bottom image. 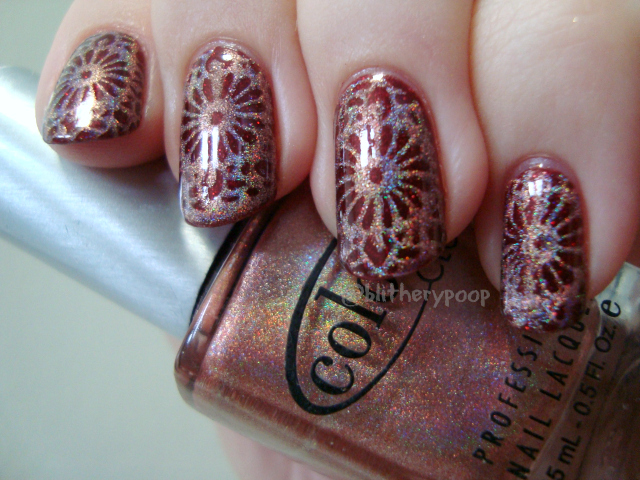 No stamper I have could get a clear transfer of the image with Cult Nails Nevermore. Dammit. I'll try again later with another polish before reaching a verdict on the image itself. Bundle Monster images with fine details can be picky about the polish you use, but they usually do work eventually. Overall I'm pleased with this plate set. I'm also thrilled with their customer service! They accidentally sent me two 608's and no 603, but sent me a 603 without any hassles at all. Love them even more for that! While I still have you, is this a good way to review plate sets? 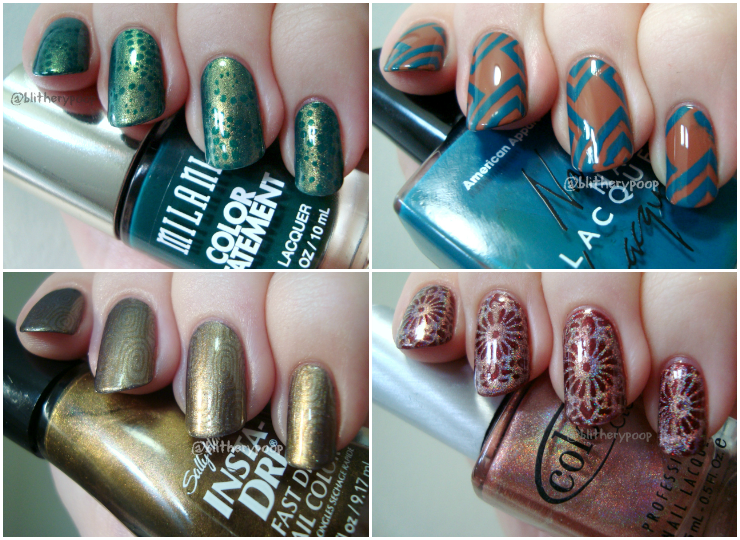 Do you prefer a few manis using a few images or a big overview of all of the images stamped onto paper? I like this way of reviewing plate sets. :) It's a good way of getting a sense of how well they work, and I'm always interested in hearing about more traditional polishes that work for stamping. It's easy enough to see what the whole set looks like from the seller's website.